Fiery quartet Family Band have announced a tour stretching from Newcastle to London which commences this Friday, 24th February. 2016 saw the band selected for the Jazz North Northern Line initiative, receive BBC radio play and record their first full length album. Now as 2017 gets started, they will perform a number of live performances showcasing material from their upcoming album as well as newly composed works. This is a superb, freewheeling band composed of four long-time musical collaborators and friends. 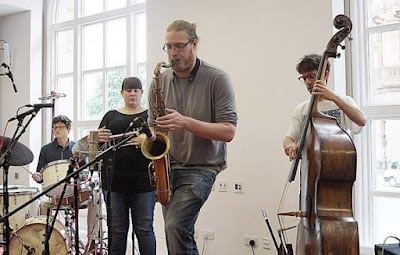 Rooted in the music of Ornette Coleman and the 1960’s avant-garde, Family Band play powerful music – moments of fierce intensity, a tender spirituality and the blues combine to form an emotionally complex and cathartic whole that rarely fails to move. They are currently preparing a second CD of music recorded live at the Manchester Jazz Festival at a terrific and well-received gig.